I raise this not to attack trade agreements, but to ask some similarly instrumental questions about the European Commission’s position on IP rights and enforcement. Over the past two decades, the EC has been a very active proponent of higher IP standards and stronger enforcement, from the ACTA agreement, to the upcoming revision to the Enforcement Directive, to the imminent extension of copyright on recordings (see Part Un). Let’s ask the obvious question: why? I’ll focus on audiovisual markets and piracy, since these are driving the EC and wider EU push on enforcement. Media piracy–not counterfeits–are why we’re talking about major changes to the emerging digital architecture of public life, including Internet surveillance, ‘3-strikes’ disconnection laws, public and private censorship of websites, and a host of other measures. According to the World Bank, Europe’s audiovisual imports exceed its exports by a ratio of around 4-1. In 2008, Europe (EU 27) imported roughly $14.7 billion in audiovisual and related services (basically, licenses for movies, TV, radio, and sound recording). In contrast, it exported about $3.9 billion, for a net trade deficit of $10.8 billion (International Trade Statistics 2010: 156). About 56% of those imports ($8.35 billion) come from the US. The EU, in turn, exports about $1.7 billion to the US, resulting in a net negative trade balance of around $6.65 billion. This does not include software licenses, where US companies monopolize larger parts of the European consumer and business markets. The US, in contrast, is a large net exporter of audiovisual goods, with roughly $13.6 billion in exports and $1.9 billion in imports. For countries or regions that are net importers of copyrighted goods, higher IP standards and stronger enforcement will result in increased payments to foreign rights holders. Because the US thoroughly dominates European audiovisual markets, stronger enforcement in these areas is, in practice, enforcement on behalf of Hollywood. Now, one can make this story more complicated. The vast majority of European audiovisual production is for domestic or intra-European consumption. Exports from European countries to each other significantly outweigh exports outside the EU (by about 50%). Won’t stronger IP laws and enforcement capture more benefits for European industry? Probably, but these should not be confused with overall benefits to the European economy. domestic piracy may well impose losses on specific industrial sectors, but these are not losses to the larger national economy. Within a given country [or in this case, region], the piracy of domestic goods is a transfer of income, not a loss. Money saved by consumers or businesses on CDs, DVDs, or software will not disappear but rather be spent on other things—housing, food, other entertainment, other business expenses, and so on. These expenditures, in turn, will generate tax revenue, new jobs, infrastructural investments, and the range of other goods that are typically cited in the loss column of industry analyses. To make a case for national economic harms rather than narrower sectoral ones, the potential uses of lost revenue need to be compared: the foregone investment in the affected industries needs to represent a better potential economic outcome than the consumer surplus generated by piracy (Sanchez 2008). The net impact on the economy, properly understood, is the difference between the value of the two investments. Such comparisons lead into very complicated territory as marginal investments in different industries generate different contributions to growth and productivity. There has been no serious analysis of this issue, however, because the industry studies have ignored the consumer surplus, maintaining the fiction that domestic piracy represents an undiluted national economic loss. For our part, we take seriously the possibility that the consumer surplus from piracy might be more productive, socially valuable, and/or job creating than additional investment in the software and media sectors. We think this likelihood increases in markets for entertainment goods, which contribute to growth but add little to productivity, and still further in countries that import most of their audiovisual goods and software—in short, virtually everywhere outside the United States. The EC clearly speaks for the European audiovisual industries on these issues, who stand, in theory, to gain from stronger IP enforcement (or maybe not!). But who speaks for the massive and very real consumer surplus? No one. I’m aware of only one study that makes any effort to model it: the Dutch government funded “Ups and Downs: Economic and Cultural Effects of File Sharing on Music, Film and Games,” which estimated the annual welfare benefit from music filesharing in the Netherlands at around 100 million euros. Multiply by 30 for a very crude extrapolation of this benefit across the EU. 17 were jointly produced by the US and one or more other countries, including 14 with European companies. UK production companies were solely responsible for 2 films, and partnered in 11 more. German companies co-produced 4 films. Canadian companies co-produced 3 films. South African and New Zealand companies were sole producers of 1 film each. Japan and Romania co-produced 1 each. French production is an interesting case given the leading French role in promoting both strong IP protection and Europeanist cultural politics–including the well known ‘cultural exception’ for trade in audiovisual goods and services. French companies figure in only 4 films on the list—and in no cases for movies filmed in France, in French, or prominently involving French actors or filmmakers. The No.1 film on the list, Source Code, was co-produced by Vendome Pictures–a relatively new French production company dedicated to producing, by all appearances, American movies. Source Code stars Jake Gyllenhaal and was filmed in Chicago. Another feature of this list is that 97 of 99 of the films are in English (the two non-English films are Indian). The list makes a strong case that, in the absence of licensing barriers, the international market is an English language market and more particularly a Hollywood market that occasionally involves foreign production partners. Even the long tail (down to #99 at least) isn’t European. For the most part, it’s composed of the Hollywood movies from the last year that you’ve never heard of: the Kevin Bacon film Elephant White; the girl surfer/shark attack/Dennis Quaid movie Soul Surfer; the Russel Crowe/Elizabeth Banks film, The Next Three Days; the Topher Grace/Anna Faris flick, Take Me Home Tonight, and many others. According to the MPAA, 677 film were produced by US production companies in 2009. That’s a lot of movies that go straight to the back catalog! And even that number is well off the peak of 2006-2007. Is this the sign of a European cinema in decline? Not if we look at the number of feature films produced, which should certainly factor into any account of piracy’s effects on incentives to produce. 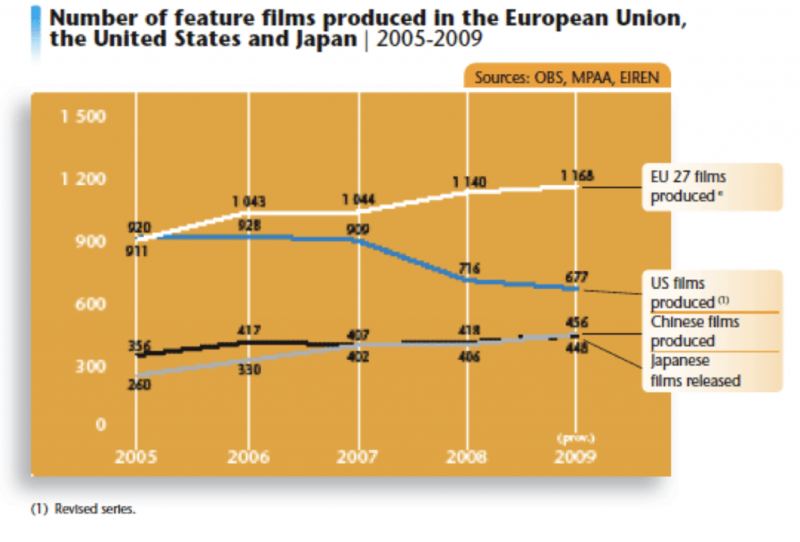 The number of feature films produced in Europe has increased every year in the last five. Almost 1200 were produced in 2009. For better and for worse, European film operates within a system of high public subsidies, low production costs, and persistent cultural and institutional market barriers at the national level. The last estimate (in 2004) by the European Audiovisual Observatory put direct public subsidies for audiovisual production at around 1.3 billion euros. The resulting industry is a major success if measured by the quantity of production, and arguably also in terms of cultural diversity and ‘quality’ of the kind associated with the auteur tradition. But the European cinema also remains resolutely ‘national,’ with a high proportion of revenues coming from domestic distribution and relatively few films attaining wider European (or global) success. In other words, it’s not clear where the market obstacles stop and the mismatch of product with demand begins. Here, our list of downloaded films points to the future–and to the main dilemma facing European cultural policy. The emergence of a more unified audiovisual market suits both the political project of European unity and the culturalist project of making more European productions available to more Europeans. Given the current constraints, lower barriers to licensing will certainly increase the range of European offerings to European consumers. But there’s a catch: so far, the European market (and beyond that, the global market) has had little to do with expressions of cultural specificity or auteur-driven visions. It has to do, above all, with making films in English that minimize those particularities. It means producing a Europe built around historical epics (Ironclad), sci-fi/fantasy (Inception, Harry Potter) or, often quite literally, the perspective of the universal (American) tourist, like last year’s The Tourist (Johnny Depp in Venice) or Unknown (Liam Neeson in Berlin). All of the above were joint US/EU productions on our July download list. And it means a European film industry reorganized further into an investment vehicle for Hollywood movies, like Vendome Pictures, the now defunct publicly-funded Medienfonds in Germany (Battlefield Earth, Terminator 3), or Luc Besson’s massive, soon-to-be opened Cite du Cinema north of Paris. My goal is not to make an anti-Hollywood argument here. There are pros and cons to this system of public subsidies, and greater integration into the global market might be, on balance, a good thing in business and cinematic terms. But it is important to be clear about the future that the EC is promoting with its IP policies. It is not a defense of European heritage or–primarily–a vision of the French auteur able to bring his or her distinctive vision to a global audience. It’s a vision of European production companies as slightly better integrated junior partners in global Hollywood. Moralizing IP rhetoric is also a handicap in this context. Continuing to defend IP as a fundamental right long after it has been made an object of trade policy is to surrender any real leverage in making deals. A trade negotiator would be very lucky have such a partner on the other side of the table. Where could Hollywood find such a partner? I know and understand that our french conception of author’s rights isn’t the same as in the United States or other countries. I simply want to say that we hold to the universal principles proclaimed in the American constitution as much as in the Declaration of the Rights of Man in 1789: that no one should have the product of their ideas, work, imagination–their intellectual property–expropriated with impunity. Each of you understands what I say here because each of you is also a creator, and it is in virtue of these creator’s rights that you have founded businesses that today have become empires. The algorithms that give you your strength; this constant innovation that is your force; this technology that changes the world is your property, and nobody contests it. Each of you, each of us, can thus understand that the writer, the director, or the performer can have the same rights. — French President Sarkozy, opening the ‘e-G8’ conference that he convened this past April. With this fulsome praise of tech and media CEOs at the e-G8, Sarkozy expressed the basic European cognitive dissonance on IP: the embrace of universal rights as a way of pretending equality with the real powers in the room. More cynically, this is the embrace of the foreign agenda as a way of rewarding the local junior partners. Indigenous elites used to play this game with the French back when they had the empire. How did Europe get here? Tellingly, there was initially little European enthusiasm for a broad trade agreement on IP in the 1980s. By most accounts, lobbying by US tech and pharmaceutical industries made the difference, capitalizing on a wider overestimation of–and nostalgia for–Europe’s role as a cultural superpower, when it was the primary beneficiary of stronger international IP laws. More narrowly, the European Commission’s IP activism can be traced to the actions of a handful of American CEOs, who convinced their European counterparts of the benefits of a global IP deal in the run-up to the WTO agreement in the 1980s. Those counterparts, in turn, applied pressure on their national governments and, through them, the EC. This gambit has been described in several histories of the WTO negotiations, including Peter Drahos and John Braithewaite’s excellent Information Feudalism. EC bureaucrats were less keen on trying to harmonize intellectual property standards via the trade regime. They had had some experience of the difficulties of trying to harmonize intellectual property standards in Europe. Some states, such as Germany and the UK, were keen on higher standards while others, such as Spain and Italy, were not so inclined. The view coming out of the EC at this time was to press on with the initiative on counterfeiting in the GATT (a lot of luxury European trade marks were the subject of counterfeiting) and make a general IP code a much longer-term priority…. The problem facing Pratt and Opel [Edmund Pratt, CEO of Pfizer and John Opel, Chairman of IBM] was clear enough. They had to convince business organizations in Quad countries [the US, the EU countries, Japan, and Canada] to pressure their governments to include intellectual property in the next round of trade negotiations. That meant first convincing European and Japanese business that it was in their interests for intellectual property to become a priority issue in the next trade round…..
Pratt and Opel’ s response was swift. In March 1986 they created the Intellectual Property Committee (IPC).24 The IPC was an ad hoc coalition of 13 major US corporations: Bristol-Myers, DuPont, FMC Corporation, General Electric, General Motors, Hewlett-Packard, IBM, Johnson & Johnson, Merck, Monsanto, Pfizer, Rockwell International and Warner Communications. It described itself as ‘dedicated to the negotiation of a comprehensive agreement on intellectual property in the current GATT round of multilateral trade negotiations’ (pp.117- 118) …. Enrolling European business in the network was the essential first step for the IPC… The IPC had established a line of dialogue with the Union of Industrial and Employers’ Confederations of Europe (UNICE) in November 1986. It proved vital. In Europe’ s more hierarchically ordered world of business lobbying, UNICE was the key portal of European business influence on the EC. During 1986 and 1987 close cooperation developed between UNICE representatives and EC officials; UNICE was given the opportunity to comment on the EC’ s negotiating position and drafts. In May 1987 UNICE produced its own position paper on GATT and intellectual property arguing that the EC’ s approach was ‘deemed too narrow by European industry’ and that the ‘scope of the negotiations must be broadened’ to include other areas of intellectual property where European industry was making heavy R&D investments. In the following months this became the position of European Community negotiators (p.128)…. Perhaps what US CEOs were able to sell to their European and Japanese counterparts was a vision of a globally secure business future. Ultimately, US corporations might do best out of the globalization of intellectual property standards. A world in which US corporations were dominant but European and Japanese corporations still remained powerful players and strategic partners was preferable to a world in which corporations from all these countries faced competition from increasingly efficient developing country manufacturers. It made sense for the most powerful corporations from the world’ s three strongest economies to collaborate on a project that would enable them to lock up the intangible assets of business in the new millennium and allow them to use those assets to set up production facilities wherever it suited them best. The international character of their production along with their need to capture new markets became the basis of the mutual interest needed for an alliance between them. (p.119) …. So what would a disenchanted, liberated EC do? As an American citizen, it is perhaps presumptuous to make suggestions. But as a French citizen, hey, it’s my EC too! It could start by distinguishing more clearly between the broader welfare interests of EU citizens and the commercial interests of junior production partners in global Hollywood. In an earlier era, it was plausible to think of these commercial and public interests as substantially the same. 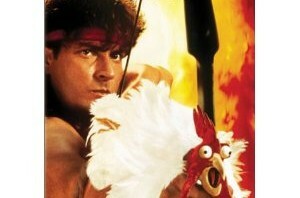 Movies were cheap and played a much larger role in public culture. French or German or Swedish cinemas made stronger claims to being globally-relevant, distinctive national cultural champions. Copyright infringement was harder, less frequent, and generally industrially organized, which made enforcement a relatively painless proposition. Today is different. As IP enforcement targets individual behavior and comes into conflict with other basic values (privacy, freedom of expression), commercial and public interests have begun to diverge. The EC could also think differently about Europe’s opportunities in the larger digital media transition. Where some parts of the EU audiovisual industries lose from piracy, the larger impact is chronically exaggerated in EC statements and mitigated (if not completely overshadowed) by the EU system of public subsidies for production. This may be an inefficient system that produces a lot of movies that relatively few people want to see, but it’s arguably a pretty good model for managing the transition to a more fully realized digital media economy, in which piracy drives the development of cheap, legal, digital access (see Netflix, Hulu, Spotify), and public subsidies ensure that there’s a lot of relatively rich European content to distribute. That, it seems to me, is a plausible vision of a digital media economy that leverages Europe’s strengths, rather than reinforces its weaknesses through a costly war on internet users. Creating a more unified European audio-visual market is an important goal in this context, but also an achievement that is likely be built on the homogenization of EU production. The public subsidy model is probably the only counterweight–at a continued cost to wider commercial prospects. Struggling to adopt the fragile economics of Hollywood blockbusters, in contrast, is a risky bet that should probably be left entirely to the commercial sector. Leading the way in strengthening digital enforcement seems like an especially bad choice in this context since its short term effect is just to send money to the US. Europe has little to lose from a wait-and-see approach. De-moralizing the IP debate is also an important step. At the Americans’ insistence, it’s a trade policy debate now, and nothing should be freely conceded by the lesser partner in those trades. 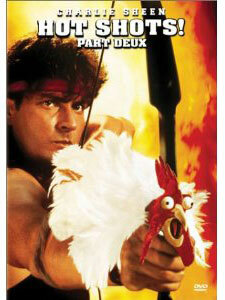 What, in other words, do the French get in return for enforcing Hollywood’s copyrights? The answer should not be limited to: the dignity of the French auteur. Don’t bring a knife to a gun fight.